To Cite: Song P, Qin J, Yu Y, Shi C , Qiao P, et al. Comparative Performance of Magnetic Resonance Angiography and Digital Subtraction Angiography in Vessel Involvement of Pediatric Moyamoya Disease, Iran J Radiol. 2019 ; 16(1):e55595. doi: 10.5812/iranjradiol.55595. Background: Recently, magnetic resonance angiography (MRA) has been widely used for the detection of moyamoya disease (MMD). However, the diagnostic performance of MRA in the detection of the affected artery in MMD remains unclear. Objectives: To assess the diagnostic performance of MRA in detecting internal carotid artery (ICA), anterior cerebral artery (ACA), middle cerebral artery (MCA) or posterior cerebral artery (PCA) involvement (including stenosis and occlusion) compared with digital subtraction angiography (DSA) in pediatric MMD. Patients and Methods: Fifty-eight pediatric patients diagnosed with MMD by MRA and DSA within one week from September 2010 to September 2011 were evaluated. Results: Among 261 vessels of occlusion demonstrated by MRA, 48 vessels of stenosis were confirmed by DSA. There was a similar detection rate of vascular lesions by MRA and DSA in ICA, ACA and PCA. More lesions in MCA were detected as occlusion by MRA than DSA. MRA was more sensitive and accurate in diagnosing vascular lesions, including ICA, ACA and MCA, while it was most specific and lowest sensitive was found in diagnosing PCA. In addition, MRA was moderate to highly consistent with DSA in diagnosing MCA and PCA. Conclusion: MRA had an important diagnostic value in the detection of the affected ICA, ACA, MCA and PCA with DSA as the gold standard, but with an overestimated evaluation of stenosis severity in pediatric MMD. Stroke has been the second leading cause of death and most frequent cause of permanent disability worldwide, with an annual incidence of 2400 new strokes per 1000000 inhabitants (1-3). Although it occurs extremely rare in childhood, with an estimated annual incidence of 2 - 3 cases/100000 in children aged > 5 years and 8 - 13 cases/100000 in children aged 5 - 14 years (4). Notably, the incidence is higher in neonates (25 - 40/100000 births) (5); besides, the mortality rate by stroke is up to 20% in infants (6). Moyamoya disease (MMD), a known cause of pediatric stroke, is a chronic and progressive cerebrovascular disease typically characterized by bilateral stenosis and/or occlusion of the distal internal carotid artery (ICA), the proximal anterior cerebral artery (ACA) and middle cerebral artery (MCA), accompanied by abnormal vascular network at the skull base (7). Currently, MMD accounts for approximately 6% of pediatric stroke (8). The cause of MMD remains unclear, but it seems to be associated with certain genetic disorders, including Down’s syndrome, Graves’ disease, Alagille syndrome, and neurofibromatosis type-1 (9-12). The unknown etiology and the slowly progressive pathogenesis lead to the delayed diagnosis of MMD until symptoms are recurrent (13). In recent years, digital subtraction angiography (DSA) has been accepted as the gold standard for the diagnosis of MMD. However, when it comes to affected young children, DSA is limited because of the invasive and time-consuming procedure (14). With the recent developments in technology, magnetic resonance angiography (MRA) has been widely used for the detection of MMD. A previous study has reported the merits and limitations of MRA in the diagnosis and following up of moyamoya patients, with conventional cerebral angiography (CCA) as ‘gold standard’ method (15). The purpose of this study was to assess the diagnostic performance of MRA in the detection of affected ICA, ACA, MCA as well as posterior cerebral artery (PCA) (including stenosis and occlusion) with DSA as the gold standard in pediatric MMD. This study retrospectively evaluated a total of 58 Chinese pediatric patients (32 males and 26 females, median age 8.5 years, range 2 - 12 years) who were diagnosed with MMD in our hospital from September 2010 to September 2011. The patients underwent different imaging modalities; however, some patients only underwent MRI and CT but not MRA. The reason was that the patients had normal imaging manifestations based on MRI and CT, so other diseases were considered but not brain diseases due to the limited knowledge of the local doctors for MMD. MMD was diagnosed according to the guidelines of the Ministry of Health and Welfare, Japan as follows: Bilateral vessels with severe stenosis or obstruction was observed at least, including the terminal segment of ICA, the initial segment of ACA, the initial segment of MCA, and PCA (16). The inclusion criteria were (1) an age of 2 - 12 years; and (2) underwent CT, MRI, MRA and DSA in turn (the standard of care in our hospital) within one week. Patients with only one vessel of occlusion or stenosis, who were not in hospital for surgery, or who had incomplete CT, MRI, MRA or DSA data were excluded. This research protocol was approved by the Ethics Committee of our hospital. The clinical syndromes and the initial diagnosis of the patients were recorded. MR imaging (MRI) was performed in a 1.5-T MR Unit (Signa Horizon, GE). Conventional MRI examination was conducted on T1WI and T2WI axial plane, fluid attenuated inversion recovery (FLAIR) coronal plane, and T1WI sagittal scanning. The MRA was performed without administration of IV contrast using three dimensional Fourier transformation time-of-flight (3D FT TOF) technique and the positioning line was set up on the basis of anterior-posterior genu and splenium of the corpus callosum. The standard MR parameters included: Repetition time (TR) of 32 milliseconds, echo time (TE) of 6.9 milliseconds, acquisition matrix of 256 × 256, field-of-view (FOV) of 16 × 16 cm2, slice thickness of 1.4 mm and 4 minutes and 29 seconds on average of acquisition time. Partial maximal intensity projection (MIP) vascular image reconstruction was generated. The DSA was performed with a monoplane DSA unit (Siemens Axiom Artis FA, Erlangen, Germany). Femoral catheterization was conducted using the Seldinger technique, with 4F catheter up to the bilateral ICA and bilateral vertebral artery to obtain angiograms. Non-ionic contrast material (Ioversol 320, Optiray; Mallinckrodt Inc.) was used for each injection: 3 mL/s for the internal carotid artery and 2 mL/s for the vertebral artery, with a total amount of 5 mL/s. Anteroposterior and lateral images of cerebral vessels were obtained at arterial, parenchymal and venous phases. The 58 cases of 3D TOF MRA were interpreted independently by two neuroradiologists, who had several years of experience in vascular diagnostic neuroradiology. Pediatric MMD is often involved in four cerebral vessels, including the ends of bilateral ICA and the initial segments of ACA, MCA and PCA, and the four arterial lesions as above were assessed for presence or absence of vascular occlusion or stenosis. Disagreements between the two neuroradiologists were resolved by discussion until consensus was achieved. All statistical analyses were performed using SPSS 20.0 (SPSS Inc, Chicago, IL, USA). DSA was considered as the gold standard and the positive detection rates of MRA and DSA were compared by McNemar test. Subsequently, the numbers of true positive (TP), false negative (FN), true negative (TN) and false positive (FP), positive predictive value (PPV), negative predictive value (NPV), sensitivity, specificity and accuracy of MRA were calculated. The test agreement for presence of vascular occlusion or stenosis was evaluated by using kappa (κ) statistics. A κ value of > 0.75 was considered as excellent concordance, κ of 0.4 - 0.75 as moderate-high concordance, and κ of < 0.4 as poor concordance (17). Patients’ clinical symptoms are shown in Table 1. Limb paresis, headache and impressive aphasia were the most common clinical syndromes, which accounted for 86.2%, 39.5% and 36.2% of the total patients. In this study, a total of 464 vessels (C1 segment of bilateral ICA, A1 segment of ACA, M1 segment of MCA, P1 segment of PCA) were assessed by MRA and DSA examinations for the 58 cases of pediatric MMD. Among these vessels, 261 (56.3%) vessels of occlusion were diagnosed by MRA. However, only 213 (45.9%) vessels of occlusion were demonstrated by DSA and 48 (10.3%) vessels were detected with stenosis by DSA. The discrepancies and concordance in the same case of pediatric MMD are shown in Figure 1. Figure 1. A case with moyamoya disease (MMD) was assessed by magnetic resonance angiography (MRA) (A-F) and digital subtraction angiography (DSA) (G-L). The arrow shows smoke-like vessels of the internal carotid artery (ICA), anterior cerebral artery (ACA) and middle cerebral artery (MCA); A, No evidence in the M1 segment of bilateral MCA; B, Occlusion in the A1 segment of bilateral ACA; C, Occlusion in the C1 segment of bilateral ICA; D, Occlusion of the bilateral ACA; E and F, Occlusion in the A1 segment of bilateral ACA and the M1 segment of bilateral MCA as well as smoke-like vessels of distal vessels; G and H, Occlusion in the C1 segment of the right ICA and posterior cerebral artery (PCA) visualization; I, Occlusion in the C1 segment of the left ICA and PCA visualization; J, Stenosis in the left MCA (K) and bilateral PCA (L). During the 3D TOF MRA examination, there were many cases of multi-vessel involvement among the 58 patients, including 17 cases of ICA, ACA, MCA and PCA involvement, 29 cases of ICA, ACA and MCA involvement, and five cases of ACA and MCA, four cases of ICA, MCA and PCA, and three cases of ICA and ACA. Besides, 33 patients showed that intracranial blood supply was compensated via bilateral superficial temporal artery, and 42 cases displayed compensated circulation through posterior communicating artery by the 3D TOF MRA examination. Furthermore, Table 2 shows that MRA had a similar detection rate of vascular lesions (occlusion or stenosis) as DSA at the same sites in ICA, ACA and PCA. However, when it comes to MCA, many vascular were misdiagnosed as occlusion or overestimated as stenosis by MRA according to DSA (P = 0.049). Abbrevations: ACA, anterior cerebral artery; DSA, digital subtraction angiography; ICA, internal carotid artery; MCA, middle cerebral artery; MRA, magnetic resonance angiography; PCA, posterior cerebral artery. b P < 0.05 was considered as statistically significant. Table 3 gives the numbers of TP, FN, TN and FP, sensitivity, specificity, PPV, NPV and accuracy of MRA for the detection of affected ICA, ACA, MCA and PCA (including stenosis and occlusion) in MMD patients. With DSA as the gold standard, MRA was sensitive in the diagnosis of the affected four ICA, ACA, MCA vessels, and the corresponding sensitivity was 92.2% (left) and 95.9% (right), 96.2% (left) and 100% (right), and 96.2% (left) and 98% (right), respectively. Despite the lowest sensitivity, MRA was most specific in examining PCA, with a specificity of 76.2% (left) and 81.0% (right). The accuracy of MRA on the detection of the affected ICA [86.2% (left) and 84.5% (right)], ACA [91.4% (left) and 94.8% (right)], and MCA [93.1% (left) and 89.6% (right)] was also higher than PCA [75.9% (left) and 79.3% (right)]. MRA was more accurate in assessing ICA, ACA and MCA, but with moderate to high concordance with DSA in diagnosing MCA (κ = 0.501, left and 0.486, right) and PCA (κ = 0.499, left and 0.404, right). Abbreviations: ACA, anterior cerebral artery; DSA, digital subtraction angiography; FN, false negative; FP, false positive; ICA, internal carotid artery; MCA, middle cerebral artery; MRA, magnetic resonance angiography; NPV, negative predictive value; PCA, posterior cerebral artery; PPV, positive predictive value; TN, true negative; TP, true positive; MMD, moyamoya disease. MRA has been used in the diagnosis of MMD in clinic, while few researches on the availability of MRA on the vessel involvements in pediatric MMD were reported. The present study analyzed the diagnostic performance of MRA for the detection of the affected ICA, ACA, MCA or PCA in pediatric MMD. Using DSA as the gold standard, higher sensitivity of MRA was shown within ICA, ACA, and MCA than PCA. A previous study showed a similar MRA sensitivity of 82% for cerebral vessels (18); Catalano et al. (19) also reported the sensitivity of MRA was 98% in examining carotid arteries, both of which were consistent with our study. The high sensitivity of MRA indicated that MRA can be used as an effective diagnostic method for vessel involvement in pediatric MMD. However, a considerable amount of MMD children lacked specific clinical manifestations. Besides, there were large differences in the clinical symptoms and diversification in disease development and imaging findings. Hence, misdiagnosis and missed diagnosis usually occurred. That was also the reason why MRA was less specific in the diagnosis of MMD. The highest specificity of MRA in the diagnosis of vessel involvement of MMD was only 80.10%. Nevertheless, MRA detection was still of great importance for the early diagnosis, early treatment and early intervention of pediatric MMD to reduce mortality and morbidity. With the technique of 3D TOF MRA, the affected area could be accurately revealed, the formation of collateral circulation of involved vessels could be observed and the lesion severity also could be estimated in MMD children. However, it might overestimate the severity of vascular stenosis. Among the 261 vessels of occlusion diagnosed by MRA, 48 vessels of stenosis were confirmed by DSA. This further supported previous studies both by Houkin et al. (20, 21) who reported a possibility of overestimation of steno-occlusion on MRA. The 48 vessels of stenosis included 16 lesions at the siphonal segment of ICA, eight lesions at the juncture of A1-A2 segment of ACA, eight located at the juncture of C1-M1 segment of MCA and 16 at the P1 segment of PCA. The diagnostic errors could be explained by several causes. Firstly, the stenosis occurring in the siphonal segment of ICA was mainly associated with vascular morphology (such as U-shaped, V-shaped, S-shaped, or C-shaped) and TOF effect. When the vessels were vertical to the scan plane at sideling blood vessels or flowing blood, the saturation effect appeared, making the blood signal significantly darker than the blood vessels perpendicular to the scanning plane. Secondly, the stenosis at A1-A2 juncture of ACA was caused by the ACA anatomical variation, including five vessels lacking of anterior communicating artery for blood compensation, and three in the absence of A1 segment of ACA, entirely supplied by the contralateral blood. Thirdly, the stenosis at the juncture of C1-M1 segment of MCA might be related to anthropogenic MIP reconstruction after compared with the original image. Finally, for stenosis at the P1 segment of PCA, the relatively smaller diameter and slow blood flow rate, as well as the three-dimensional volumetric imaging facilitated the emergence of blood flow saturation. On the other hand, the average false negative rate was only 0.04% (data not shown), suggesting that the missed diagnosis of MMD rarely occurred using MRA assessment. Besides, MRA was of the lowest accuracy on the detection of PCA in MMD compared with ICA, ACA and MCA, which was moderate to highly consistent with DSA in assessing MCA and PCA. The highest specificity of MRA for PCA could be explained for it. However, it is supposed that MRA is less accurate when diagnosing pediatric MMD at the point of evaluation of the revascularization than DSA due to the limitation of MRA diagnosis on small cerebrovascular lesions. This study has several limitations. First, due to the small sample and the retrospective nature of this study, more prospective studies with larger sample sizes should be performed to confirm the results of this study. Second, the relationships between MMD stage, MRA score, MRA grades and moyamoya vessel scores were not analyzed. Third, the possibility of overestimation of steno-occlusion on MRA should not be negligent. Hence, further studies on those grading systems should be performed on a large number of pediatric patients. In summary, MRA had an important diagnostic value in the detection of the affected ICA, ACA, MCA and PCA (including stenosis and occlusion) in MMD, with great sensitivity and accuracy in the affected ICA, ACA, and MCA using DSA as the gold standard. However, it was also associated with an overestimated evaluation of stenosis severity. Authors' Contributions: Peiji Song and Jing Qin should be regarded as co-first authors. 1. Roger VL, Go AS, Lloyd-Jones DM, Benjamin EJ, Berry JD, Borden WB, et al. Heart disease and stroke statistics 2012 update: A report from the American Heart Association. Circulation. 2012;125(1):e2-e220. doi: 10.1161/CIR.0b013e31823ac046. [PubMed: 22179539]. [PubMed Central: PMC4440543]. 2. Lloyd-Jones D, Adams R, Carnethon M, De Simone G, Ferguson TB, Flegal K, et al. Heart disease and stroke statistics 2009 update: A report from the American Heart Association Statistics Committee and Stroke Statistics Subcommittee. Circulation. 2009;119(3):e21-181. doi: 10.1161/CIRCULATIONAHA.108.191261. [PubMed: 19075105]. 3. Sacco RL, Chong JY, Prabhakaran S, Elkind MS. Experimental treatments for acute ischaemic stroke. Lancet. 2007;369(9558):331-41. doi: 10.1016/S0140-6736(07)60155-X. [PubMed: 17258673]. 4. Kissela BM, Khoury JC, Alwell K, Moomaw CJ, Woo D, Adeoye O, et al. Age at stroke: Temporal trends in stroke incidence in a large, biracial population. Neurology. 2012;79(17):1781-7. doi: 10.1212/WNL.0b013e318270401d. [PubMed: 23054237]. [PubMed Central: PMC3475622]. 5. Rivkin MJ, Bernard TJ, Dowling MM, Amlie-Lefond C. Guidelines for urgent management of stroke in children. Pediatr Neurol. 2016;56:8-17. doi: 10.1016/j.pediatrneurol.2016.01.016. [PubMed: 26969237]. 6. Fullerton HJ, Elkins JS, Johnston SC. Pediatric stroke belt: Geographic variation in stroke mortality in US children. Stroke. 2004;35(7):1570-3. doi: 10.1161/01.STR.0000130514.21773.95. [PubMed: 15178830]. 7. Kuroda S, Houkin K. Moyamoya disease: Current concepts and future perspectives. Lancet Neurol. 2008;7(11):1056-66. doi: 10.1016/S1474-4422(08)70240-0. [PubMed: 18940695]. 8. Smith ER, Scott RM. Spontaneous occlusion of the circle of Willis in children: Pediatric moyamoya summary with proposed evidence-based practice guidelines. A review. J Neurosurg Pediatr. 2012;9(4):353-60. doi: 10.3171/2011.12.PEDS1172. [PubMed: 22462697]. 9. Scott RM, Smith JL, Robertson RL, Madsen JR, Soriano SG, Rockoff MA. Long-term outcome in children with moyamoya syndrome after cranial revascularization by pial synangiosis. J Neurosurg. 2004;100(2 Suppl Pediatrics):142-9. doi: 10.3171/ped.2004.100.2.0142. [PubMed: 14758941]. 10. Smith JL. Understanding and treating moyamoya disease in children. Neurosurg Focus. 2009;26(4). E4. doi: 10.3171/2000.01.FOCUS08306. [PubMed: 19335128]. 11. Scott RM, Smith ER. Moyamoya disease and moyamoya syndrome. N Engl J Med. 2009;360(12):1226-37. doi: 10.1056/NEJMra0804622. [PubMed: 19297575]. 12. Guzman R, Lee M, Achrol A, Bell-Stephens T, Kelly M, Do HM, et al. Clinical outcome after 450 revascularization procedures for moyamoya disease. Clinical article. J Neurosurg. 2009;111(5):927-35. doi: 10.3171/2009.4.JNS081649. [PubMed: 19463046]. 13. Jung MY, Kim YO, Yoon W, Joo SP, Woo YJ. Characteristics of brain magnetic resonance images at symptom onset in children with moyamoya disease. Brain Dev. 2015;37(3):299-306. doi: 10.1016/j.braindev.2014.06.008. [PubMed: 25022806]. 14. Piao J, Wu W, Yang Z, Yu J. Research progress of moyamoya disease in children. Int J Med Sci. 2015;12(7):566-75. doi: 10.7150/ijms.11719. [PubMed: 26180513]. [PubMed Central: PMC4502061]. 15. Saeki N, Silva MN, Kubota M, Takanashi J, Sugita K, Nakazaki S, et al. Comparative performance of magnetic resonance angiography and conventional angiography in moyamoya disease. J Clin Neurosci. 2000;7(2):112-5. doi: 10.1054/jocn.1999.0160. [PubMed: 10844793]. 16. Fukui M. Guidelines for the diagnosis and treatment of spontaneous occlusion of the circle of Willis ('moyamoya' disease). Research Committee on Spontaneous Occlusion of the Circle of Willis (Moyamoya Disease) of the Ministry of Health and Welfare, Japan. Clin Neurol Neurosurg. 1997;99 Suppl 2:S238-40. [PubMed: 9409446]. 17. Fornwalt BK, Sprague WW, BeDell P, Suever JD, Gerritse B, Merlino JD, et al. Agreement is poor among current criteria used to define response to cardiac resynchronization therapy. Circulation. 2010;121(18):1985-91. doi: 10.1161/CIRCULATIONAHA.109.910778. [PubMed: 20421518]. [PubMed Central: PMC2882855]. 18. Cosottini M, Calabrese R, Puglioli M, Zampa V, Michelassi C, Ortori S, et al. Contrast-enhanced three-dimensional MR angiography of neck vessels: Does dephasing effect alter diagnostic accuracy? Eur Radiol. 2003;13(3):571-81. doi: 10.1007/s00330-002-1545-5. [PubMed: 12594561]. 19. Catalano C, Laghi A, Pediconi F, Fraioli F, Napoli A, Passariello R. [Magnetic resonance angiography with contrast media in the study of carotid arteries]. Radiol Med. 2001;101(1-2):54-9. Italian. [PubMed: 11360754]. 20. 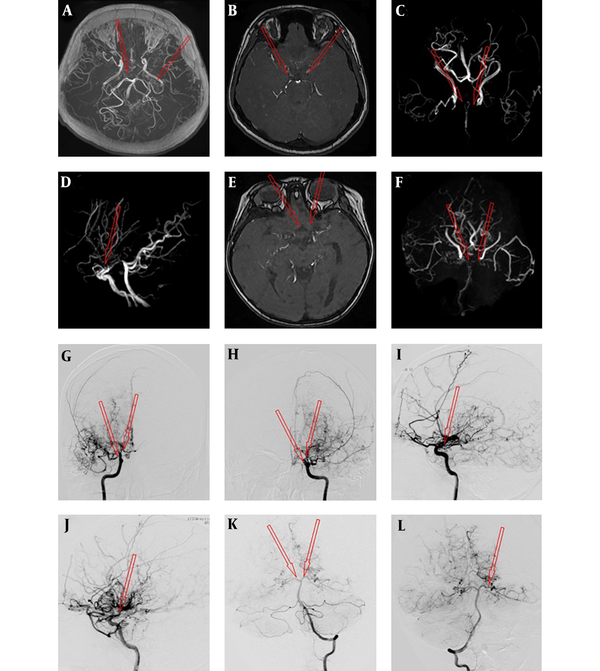 Houkin K, Aoki T, Takahashi A, Abe H. Diagnosis of moyamoya disease with magnetic resonance angiography. Stroke. 1994;25(11):2159-64. [PubMed: 7974539]. 21. Houkin K, Tanaka N, Takahashi A, Kamiyama H, Abe H, Kajii N. Familial occurrence of moyamoya disease. Magnetic resonance angiography as a screening test for high-risk subjects. Childs Nerv Syst. 1994;10(7):421-5. [PubMed: 7842430].